Peter and Angela Netmail have been traveling and making mail art wherever they go. 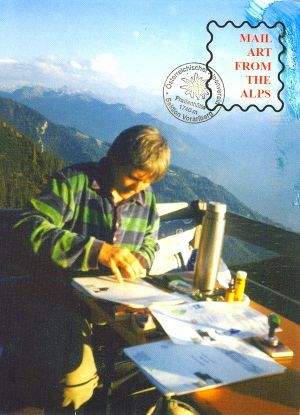 They photograph themselves in the Alps, in Macedonia, wherever they go. And Peter seems to love baking books very often. Making mail art wherever they go. Send a photo of yourself standing or sitting in front of your bookcase or bookshelves. No deadline. Answer to everyone. Bibliotheca Gullbiana, Staai 41, NL-6127 AB Grevenbicht, The Netherlands. The Beatles Forever. Postcard size 10 x 15 cm. The Tree of Poetry, Tiziana Baracchi, Via Cavallotti 83b, I-30171 Venezia Mestre, Italia. No deadline. Darwin, as a young man, travelled the world in the Beagle, as a result of which he later wrote the first edition of “On The Origin of Species by Means of Natural Selection, or The Preservation of Favored Races in the Struggle for Life. This open-call for submissions to a mail-art exhibition at the Exeter Phoenix invites a creative and imaginative interpretation of letters and postcards home from the great evolutionist. Closing date for posted submissions is: 12th November 2007. Please address all submissions to: Howard Warnerford, Exeter Phoenix, Bradninch Place, Gandy St., Exeter EX4 3LS, United Kingdom. Temple - to explore the idea of a sacred space for reflection and meditation or your own definition. Can be exploring built or internal spaces. SIZE: Minimum Post card size. Media: Open (No organic matter, our government destroys it immediately) Deadline: 15 December 2007. No Returns. Child Friendly Art. Catalogued on line. Exhibition January 2008. Send to: Taraka Tee, P.O. Box 145, Indooroopilly, 4068 Qld, Australia.